It's prime camping season, and if you partake, you know that camp cooking is an entirely different animal than kitchen cooking. First of all, you’re dealing with a different heat source than normal, not to mention cooking out of a cooler. And that’s before you even get into equipment, which ranges from super fancy camp stoves to, well, sticks. Thankfully cookbook author and avid camper Lina Ly is here to help. The New Camp Cookbook is full of recipes that wouldn’t be out of place at fancy dinner parties, despite being cooked over a campfire. She also has a lot of advice for planning your meals and packing your cooler to doing dishes at your campsite. Some of her best advice concerns foil-packet cooking. This is a camping classic: an entire meal, wrapped in foil that is both the cooking vessel and the plate you eat from. Ly likes foil-packet cooking best for dishes that “cook in their own juices,” and often uses the technique with fish, like halibut with lemon dill couscous and salmon with pineapple salsa. But this technique is great with all kinds of vegetables, and can even be used for eggy breakfast dishes. Use heavy duty aluminum foil. No one wants their foil packets to tear and lose their dinner to the campfire. In fact, Ly recommends a double layer if the packet is especially full. Oil the foil. Don’t go to all that work only to have your fish stick to the foil! Leave room in the packet. When sealing up your foil packet, leave some room for steam to circulate and cook the food. Rotate the packets during cooking. Use tongs. This makes sure they cook evenly. Make packets ahead of time. And stack ‘em in the cooler til you’re ready to eat. Less time chopping means more time enjoying the great outdoors. And just like that, you have a meal that's admittedly less sophisticated than a genius one-pot meal, but arguably just as easy and far more portable! What could be better when you're camping? 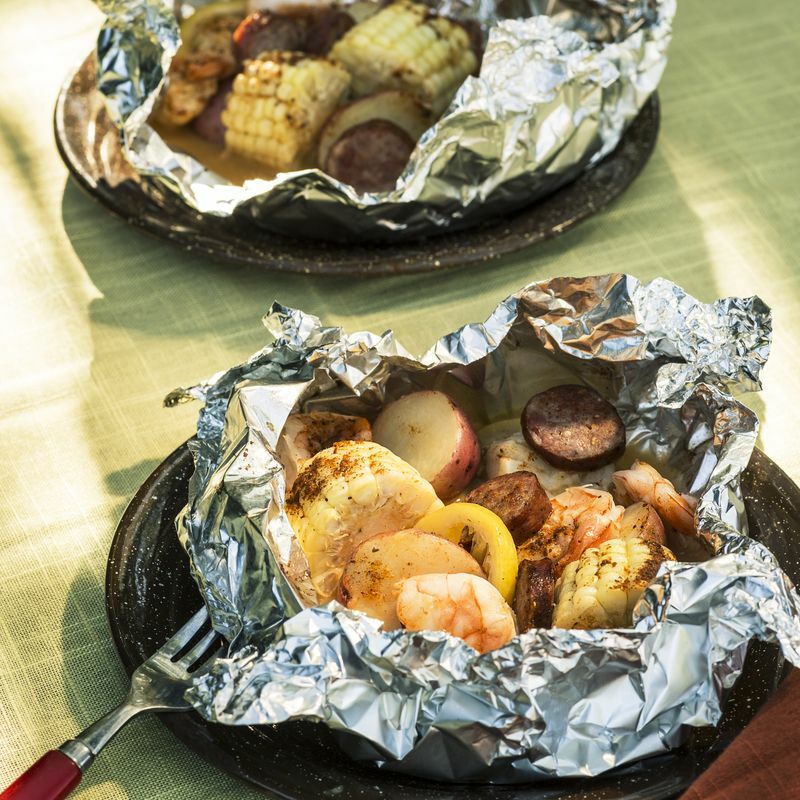 Embrace the great outdoors with foil packet meals that were made for campfire cookin'. The technique helps keep meat moist and tasty before finishing over the flame. Try two of our favorite recipes: Campfire Chicken Wings and Grilled Korean Wings, right here.